I keep adding to this Quilting Glossary on a regular basis so it will grow into a comprehensive reference guide for everyone. After you layer the back,batting, and top of your quilt, it is then temporarily held together using large stitches, safety pins, or basting spray. This "quilt sandwich" is now ready to be quilted. Once the quilting is complete, the large basting stitches or pins are removed. This is the stuffing that goes between the top and the back of your quilt. It can be polyester, wool, cotton or a cotton/polyester blend. Also called wadding in England. Batting fibers which migrate up through the quilt top. They look as if they can be brushed away, but are actually still attached to the batting layer. This most often occurs with polyester batting, especially when used under dark fabric. A good way to avoid this on a dark quilt is to use a dark batting. The final step in making a quilt, these are the strips that enclose the raw edges of your quilt. Several pieces of fabric sewn together to form one unit or block of a quilt. After finishing the center portion of a quilt, you may decide to add strips of fabric to the sides and the top and bottom to either make it look nicer or to increase the size of the quilt. When sewing many pieces of the same size and shape, you can save time and thread by feeding the pieces into the sewing machine one after the other, without even lifting the presser foot. They can then be pressed in one long string, and then cut apart into the individual pieces. 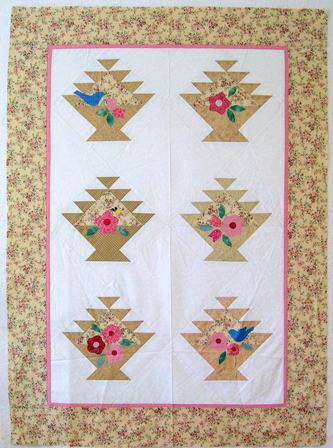 This type of quilt is made using all different sizes of scraps, rather than utilizing individual blocks. The seam lines are often intricately embroidered and embellished with buttons or charms. This is the grain line that goes at a right angle to the selvedges (ie, across the width of the fabric). There is usually some stretch to the crosswise grain. Used for free motion quilting, this sewing machine foot is usually round or oval and made of plastic so you can see through it. English Paper Piecing is a method of piecing which uses paper as a stabilizer. First, by hand, you baste the fabric to the paper (it is a little heavier than writing paper, but not as sturdy as cardboard). You hand sew right through the fabric and the paper, then you use a whipstitch to sew the sides together. When you have finished your block, then you can remove the basting and the papers, and reuse the paper. This method has been used for over a hundred years to make Grandmother's Flower Garden, Dresden Plate, and Baby Blocks, to name a few. I have done a whole quilt of Grandmother's Flower garden using 1 1/2" hexagons. It is one I am hand quilting, and will take me a long time to finish. You can see it in "My Quilt Gallery" on my website. A half yard or meter of fabric, cut along the middle fold line to make a "fat" or wide quarter, as opposed to a regular quarter yard or meter which is long and skinny! A fat quarter measures 18x22 or 20x22 (depending on whether you are in a country where yards or meters are sold), whereas a quarter meter/yard of fabric measures 9x44" or 10x44", ie the full width of the fabric. This is the size of your quilt when finished. Sewing with needle and thread rather than a sewing machine. A tube of fabric attached to the back of a quilt in order to hang it on a curtain rod or dowel. This is the grain line that runs parallel to the selvedges. There is usually very little if any stretch. The thickness or amount of puffiness of your batting. Polyester usually has a higher loft than cotton. Using your sewing machine to sew pieces of fabric together. Using your sewing machine to quilt all three layers of your quilt. Also refers to professional machine quilting by someone with a longarm machine. Refers to chalk, pencils, watersoluble markers etc which you use to mark your quilting pattern on your quilt. A memory quilt is usually made up of photographs transferred onto fabric and used in a quilt. They are particularly great for a special occasion like an anniversary or a special birthday. Scraps from the recipient's clothing or curtains or other "memorabilia" could be incorporated as well. There are many mystery quilt sites on the internet. It is a mystery because you are given the "clues" for fabric purchase, cutting instructions, and then step by step clues to assemble the quilt -- WITHOUT EVER SEEING THE FINISHED PRODUCT!! It is a mystery to the end. How much fun is that?!! Try it! A special way of piecing using a paper pattern, and sewing right through the pattern. Because you have the lines of the pattern to follow, it is very accurate. This is a lovely hand piecing method. You baste your fabric around a heavier paper template or other shape, and then whip stitch your pieces together. Usually the papers are removed later, after the block is assembled. Some antique quilts have actually been dated by newspaper which was used for the paper templates and were left in the quilt for added warmth! The top layer of your quilt, usually but not always pieced from lots of little bits of fabric. A ¼” presser foot which assists you in sewing a perfect ¼” seam. The unstitched edges of a piece of fabric. This sometimes refers to a type of quilting where pieces are left as raw edges in order to add interest to a quilt. One way to make a group quilt. In a round robin, usually you create a center for a quilt, then hand it off to another person in the group to create the next round. She will hand it off to another for the following round, and so on until the quilt top is finished, at which time it will be turned to you. There may or may not be "rules" for each round, ie, round 2 must be applique and round 3 must be paper pieced, and so on. This is a quilt in which each block is different. As well as being beautiful, it is a good way to learn to quilt. Because each block is different, you learn a variety of piecing methods. The strips of fabric surrounding the blocks in a quilt, for an example, see my beginner sampler quilts. Not all quilts have sashing. Refers to the width of a seam line. Quilters generally use a ¼” seam allowance. If there is something you may have come across that you don't understand or want an explanation for and don't see in my Quilting Glossary, please contact me and I will add it to the Quilting Glossary. Visiting all the quilt shops in a specific area. May be informally organized by you and your friends as a day trip, or sometimes organized by the group of shops as a "special" event with prizes, etc. Your fabric collection! This can be small enough to fit into a plastic bin, or it can fill the whole sewing room. It is said that she who dies with the most fabric wins. WHAT she wins we are not sure of. When you quilt in the seam lines of the quilt. The lengthwise straight of grain on fabric runs parallel to the selvedge. It has very little stretch, if any. The crosswise straight of grain is perpendicular (or at right angles) to the selvedge and is a bit more stretchy. In quilting, we are usually cutting along the crosswise grain. Instead of cutting long strips into squares and then sewing squares together, you can sew the whole long length of the strips together and then cut them into smaller units. This method saves time as well as thread. Used in patterns like Double Irish Chain. Like Strip Piecing, you sew lengths of fabric together to make a "set" and then cut across into smaller pieces. Additional stuffing in certain portions of your quilt to make those parts stand out. In my "Romantic Hearts" quilt, the hearts have been trapuntoed by placing an extra layer of batting underneath. If you want flower stems to stand out, you might insert cording. Its very effective! A UFO is any unfinished object and most quilters have them stowed away somewhere. It could be a quilt top that has not yet been quilted, or it could be blocks unassembled, or just pieces of fabric that have been cut for a project. Until it is finished, it will remain a UFO! A special presser foot which assists in the machine quilting process. It feeds the fabric from the top while the feed dogs feed from the bottom, thus helping to prevent tucks and puckering on the back of your quilt. The quilt top is made of one piece of fabric, often muslin with a quilting design printed on it. After quilting, you wash the quilt and the marked design lines disappear. You could also call a preprinted panel (eg. for a baby quilt) a whole cloth quilt as it is one piece of fabric. Some people call this a "cheater" quilt, but I like the term whole cloth quilt so much better! WOF: what does wof mean in quilting? Many quilting patterns tell you to cut strips across WOF (width of fabric). This means you fold your fabric with the selvedges together, just as it came from the store, and then cut your strips. Finished with "Quilting Glossary" Return "Quilt Homepage"